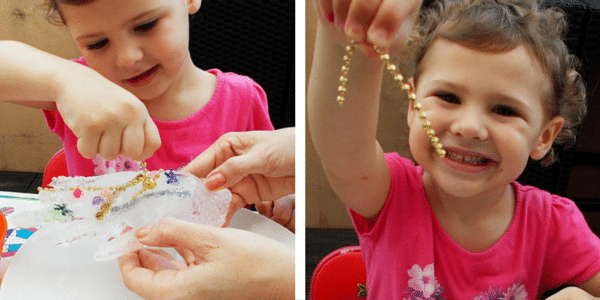 With this long heatwave we’ve been having I thought what better way to cool down than to play with some ice! 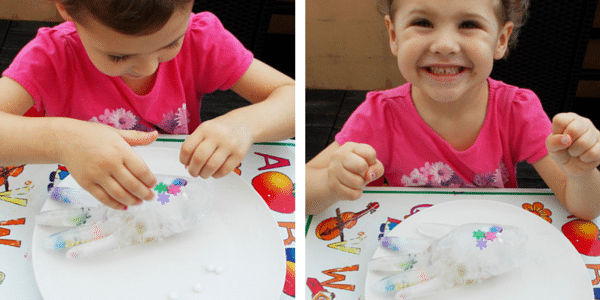 Here are 2 Frozen kids activities to beat the heat that are guaranteed to keep the kids entertained and cool! Great for holiday play dates too! 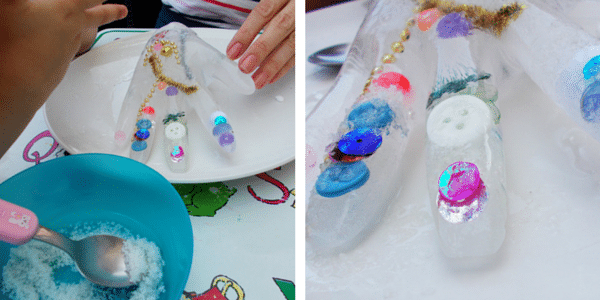 Elsa fans will love this activity! 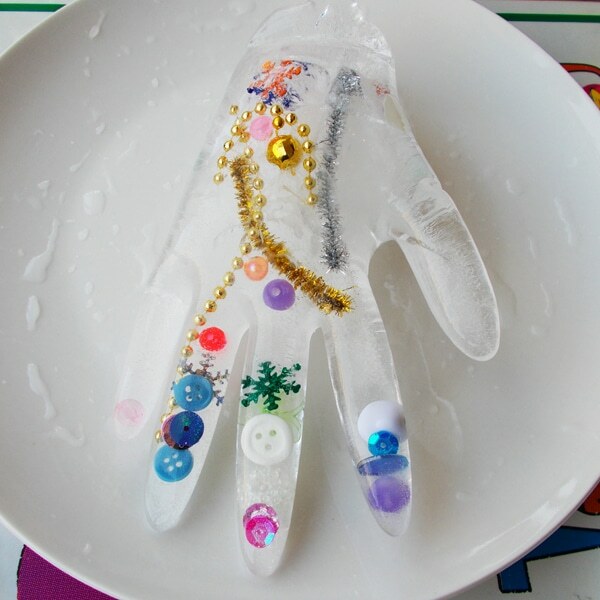 Ever felt the touch of a frozen hand? 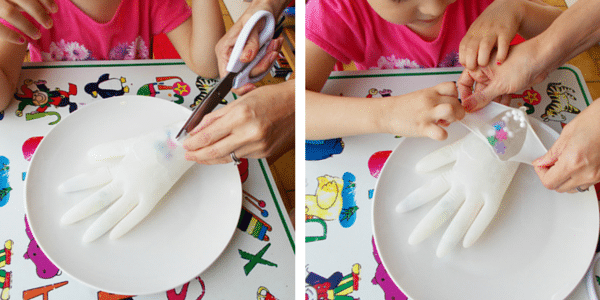 All you need are some latex gloves (which you can buy from your local supermarket or chemist) and small, colourful items that will fit into the glove and it’s fingers. It’s best to use items that can get wet. You could even throw in some glitter if you have some! Put all your small items into the glove. And the fingers too! 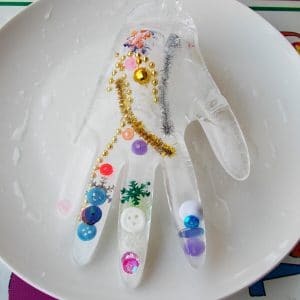 Add cold water to fill the glove about 3cm from the top. Tie a knot in the top of the glove. Lay the hand flat on the plate and spread the fingers open so they are not touching. 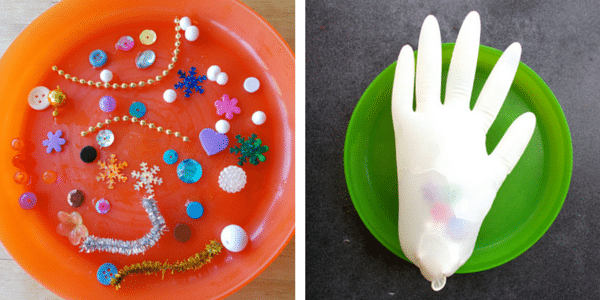 It’s important that the hand can lie flat in the plate so that when it freezes it stays flat. 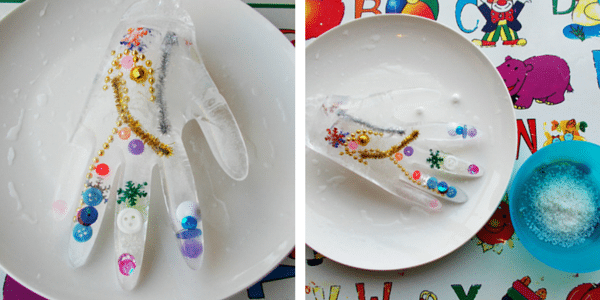 Put into your freezer and freeze the hand overnight. The next day take the hand out of the freezer. Put it onto a new plate so you don’t get any condensation on the plate. Let your child touch it and ask them how it feels? Use scissors to cut the knot off the glove. (Run the knot part under the cold water tap for a few seconds if it’s frozen stuck. Have fun peeling off the glove. Isn’t it interesting how kids love to “peel” things! What can you see inside? What can you see inside the hand? Can you name all the items? Use your imagination when you describe them! Can you pick out any of the sequins or beads yet? Probably not! So we need some salt to help melt the ice. Pour some salt into a bowl and get ready to melt the ice hand! Can you pick it up? How does it feel? Sprinkle salt all over the hand. I found coarse salt works faster than fine salt. Encourage your kids to have the patience to wait for the salt to melt the ice. If they can’t wait, let them rub their fingers on the hand to help it melt faster. As a last resort, if they really can’t wait, pour a bit of water on the hand. 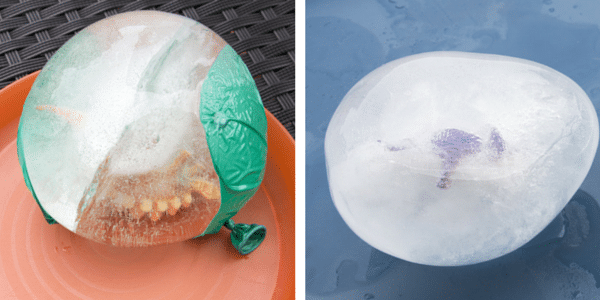 As the ice melts, the items will be exposed and they can try and pry them loose. Collect them in a small bowl to keep safe to re-use! To speed the process add more salt or a little warm water! Be careful of sharp edges that form as the ice melts. 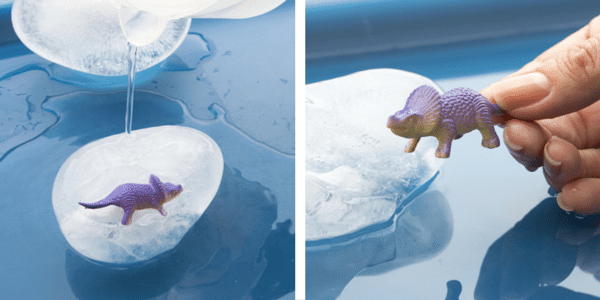 Have you ever hatched a dinosaur from a frozen egg? All you need is a balloon or two and a small toy! You can use any small toy that can get wet. It just has to be able to fit through the neck of the balloon once you’ve stretched it open. Now slowly fill it with water by stretching the opening over the tap. I make them about the size of a grapefruit. Careful it gets heavy! Gently let out the air and tie a knot in the neck. Put the egg into a container and freeze overnight. The next day take the balloons out of the freezer. Put them on a tray so you don’t get any condensation on the table. Let your child touch it and ask them how it feels? COLD! Pick it up. Is it heavy? What could be inside? 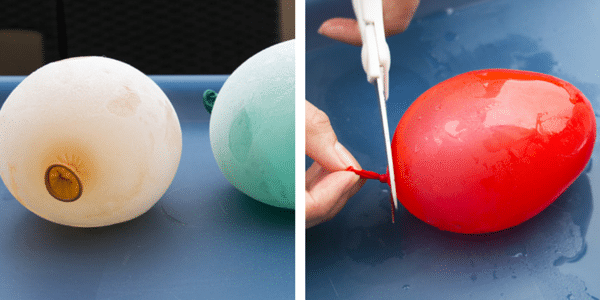 Use scissors to cut the knot off the balloon. (Run the knot part under the cold water tap for a few seconds if it’s frozen stuck. What can you see hidden inside the egg? Is there a baby dinosaur in there? Pick it up and turn it over to see if you can get a better look at what’s inside. How long do you think it takes to melt? Is there a way to make it melt faster? Try sprinkling some salt on top. Can’t wait? Fill a jug with warm water and pour it on the egg! How about putting the eggs in a bucket of water or in the bath with you! I guarantee your kids will want to do this again and again! In our next post, I’ll be giving you more fun activities to do with your balloons and latex gloves so be sure to go and buy some!